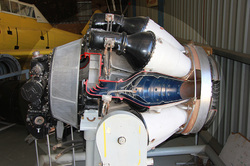 The Rolls-Royce RB.41 Nene was a 1940s British centrifugual compressor turbojet engine. The Nene was basically a larger version of the Derwent engine with minimal changes needed to deliver 5,000 lbf, making it the most powerful engine of its era. The Nene was Rolls Royce's third jet engine to enter production and was designed and built in an incredibly quick five-month period in 1944, with the first running on 27 October 1944.